BEA AHBECK/NEWS-SENTINEL Jami Reeder and Della Navarro, both of Lodi, share a laugh during the Lodi Wine & Food Festival at the Grape Festival grounds in Lodi Saturday, April 7, 2018. 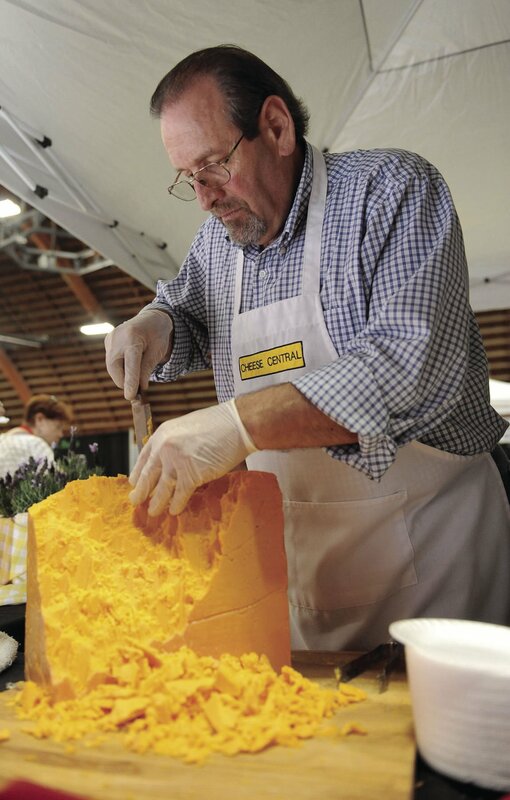 BEA AHBECK/NEWS-SENTINEL Cheese Central's co-owner John DellaMonica cuts up a 3 1/2 year aged chedar during the Lodi Wine & Food Festival at the Grape Festival grounds in Lodi Saturday, April 7, 2018. BEA AHBECK/NEWS-SENTINEL Wine is poured during the Lodi Wine & Food Festival at the Grape Festival grounds in Lodi Saturday, April 7, 2018. BEA AHBECK/NEWS-SENTINEL Kevin Stevens, of Nashville, Tennessee, samples wine during the Lodi Wine & Food Festival at the Grape Festival grounds in Lodi Saturday, April 7, 2018. BEA AHBECK/NEWS-SENTINEL Shelley Oto pours salsa on her Habanero Hots sample during the Wine and Food Festival at the Grape Festival fairground in Lodi Saturday, April 1, 2017. On Saturday, lovers of fine wine and delicious food will immerse themselves in a world of flavor at the Lodi Wine and Food Festival. “It’s fun to see people there who are really discovering the new wines,” said Mark Armstrong, manager of the Lodi Grape Festival Grounds and organizer of next weekend’s festival. And there will be plenty of new wines to sample, from Lodi-area wineries and visitors from Manteca, Livermore, Murphys and Paso Robles. “We’re excited to have new wineries,” Armstrong said. New among the 44 attending wineries this year are Riboli Family Wines and Lodi’s own Cabana Winery. Cabana Winery sources its grapes from Napa, Sonoma and Amador as well as Lodi. The boutique winery produces all of its wines on-site right in Lodi. Riboli’s roots stretch back to 1917, when Italy native Santo Cambianica founded San Antonio Winery in Los Angeles. Stefano Riboli traveled to the United States in 1936 and apprenticed as a winemaker under Cambianica, his uncle. In the 1950s, Riboli and his family moved their winery operations north. Riboli Family Wines is currently based in Paso Robles. It’s also the first time Nostra Vita Family Winery, formerly Abundance Vineyards, will appear under its new ownership and identity. Favorites including McCay Cellars, Macchia, Gnarley Head, Fenestra Winery, Barsetti Vineyards and Oak Farm Vineyards will also be pouring their wines, among dozens of others. Local favorites like Habañero Hots, Cheese Central, Nothing Bundt Cakes and Hollywood Family Cafe will be serving up delicious snacks at the event. They’ll be joined by a few unique options, such as Alison’s Gourmet Brittle, serving up almond brittles in a variety of flavors, and Rotzy’s Mad Batter, which makes cookie dough that’s safe to eat without baking. While most of the cooks and business owners turn food into a figurative art, one of the festival’s featured chefs takes that literally. “We have Chef Ray Duey, and he takes all kinds of fruit and vegetables and carves them,” Armstrong said. Duey has earned a reputation for sculpting works of art out of produce. In 2010, he even visited the White House and carved an elaborate haunted house out of pumpkins. Local and visiting olive oil producers — including Calivirgin, Colomba Bianca, Olive Drop Olive Oil and Theofani’s Extra Virgin Olive Oil — will be offering tastings of their wares. Jazz acoustic guitarist Travis Vega will provide background music — but nothing too loud, and not indoors. Visitors will be able to chat with each winery’s representatives. In fact, that’s one thing that sets the Lodi Wine and Food Festival apart from festivals in Napa, Armstrong said. “At our event, you would probably see more of the winemakers and owners in the booth,” he said. Visitors are encouraged to talk to them about their wines. The VIP lounge has been expanded for this year’s event and moved outside to enjoy the weather. McCay Cellars will be offering special barrel tasting in the lounge. Many visitors stop by Downtown Lodi before and after the event to shop and dine (as the food offerings at the festival are mainly sample sized), Armstrong said. One caveat: While service dogs will be admitted, no pets will be allowed on the grounds during the festival. Neither will anyone under 21, including infants and toddlers, so be sure to hire a sitter if you plan to attend. When: 3 to 6 p.m. Saturday, March 30; VIP ticket-holders admitted at 2 p.m.